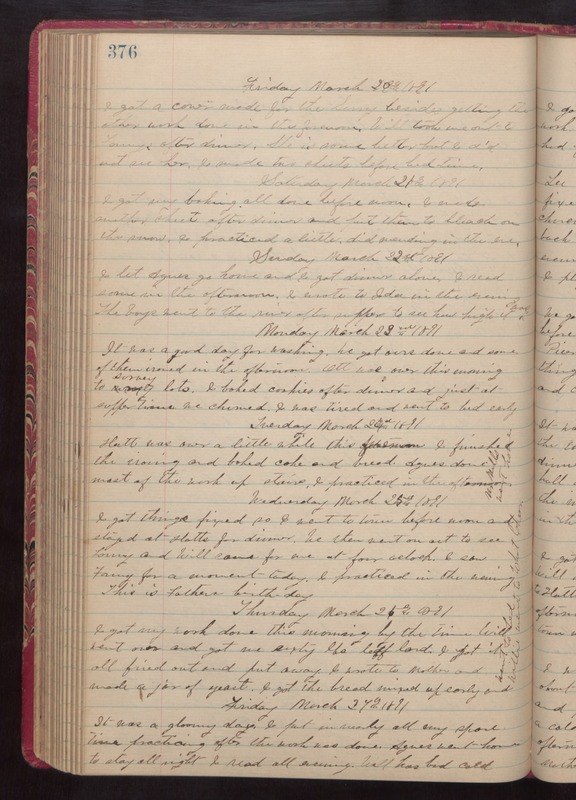 Friday March 20th 1891 I got a cover made for the Surry besides getting the other work done in the forenoon. Will took me out to Fannys after dinner. She is some better but I did not see her. I made two sheets before bed time. Saturday March 21st 1891 I got my baking all done before noon. I made another sheet after dinner and put them to bleach on the snow. I practiced a little. Did mending in the eve. Sunday March 22nd 1891 I let Agnes go home and I got dinner alone. I read some in the afternoon. I wrote to Ida in the evening. The boys went to the river after supper to see how high it was. Monday March 23rd 1891 It was a good day for washing. We got ours done and some of them ironed in the afternoon. Ott was over this morning to survey lots. I baked cookies after dinner and just at supper time we churned. I was tired and went to bed early. Tuesday March 24th 1891 Hatt was over a little while this forenoon. I finished the ironing and baked cake and bread. Agnes done most of the work up stairs. I practiced in the afternoon. [the following text is written vertically in the right margin of the above entry] Mr. Mills went home. Wednesday March 25th 1891 I got things fixed up. I went to town before noon and stayed at Hatts for dinner. We then went on out to see Fanny and Will came for me at four oclock. I saw Fanny for a moment today. I practiced in the evening. This is Fathers birthday. Thursday March 25th 1891 I got my work done this morning by the time Will went over and got me sixty lbs [lef?] lard. I got it all fixed out and put away. I wrote to Mother and made a jar of yeast. I got the bread mixed up early and went to bed. Willie went to What Cheer. Friday March 27th 1891 It was a gloomy day. I put in nearly all my spare time practicing after the work was done. Agnes went home to stay all night. I read all evening. Will had bad cold.